Written on 08 April 2016 . 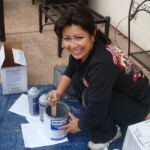 Since 1988 Erma has been applying swimming pool mastic for private home owners and pool builders in the Sacramento and surrounding areas. If you ask, “who do you know that can do pool mastic?” Erma’s name always pops up. Other clients include property management corporations, home owners associations and general contractors. She was also contracted to work at the California highway patrol head quarters in west Sacramento and the Sacramento superior court house in down town Sacramento. Her services include a self leveling liquid that dries to an expansive non corrosive rubber for horizontal expansion joints. Erma’s service plays an important role in the remodeling or new construction phase of the swimming pool industry.